Bordeaux is a region in France known for some of the most sought after and expensive wines in the world. For those on a limited wine budget, the better Bordeaux wines are usually out of reach. That’s why this week’s feature is a golden opportunity. Chateau Fontenil is a vineyard of several acres in Fronsac, on a south-facing slope that looks down at the town of Libourne. Not only does this region produce exceptional wines, this particular bottle has been bottle aged for over 16 years already. Before we get into the bottle, it’s important to note the differences between Old World and New World wines. This Bordeaux is not one to pop and pour. Even after 16 years in the bottle, it still needed about an hour to breathe. I decanted it, and let it sit after a first sip because I could tell it needed to settle down a bit. If this had been a 2002 Merlot/Cabernet from Napa, it would have been good to go right away. That’s a fundamental difference between what we are used to drinking in the United States, and what is made in the Old World style, meant for aging and to be enjoyed with food. Sipping this wine by itself is not advised, but pair it with steak and buttery mashed potatoes and you’d be amazed! The 2002 Chateau Fontenil Fronsac is a blend of Merlot with Cabernet Sauvignon, and even after 16 years is still a powerful wine. The nose is mushrooms, another famous Fronsac export, along with smoke and pepper. I was pleased with the layers of flavor when this wine finally opened up: subtle blackberry fruit, dark chocolate, a little spice, but mostly earthy flavors, and then a long, lingering finish with more dark chocolate and pepper. This wine was an experience, but one that might not be enjoyed if your favorite wine is Apothic Red or Yellow Tail. Bordeaux is a different animal, with subtle flavors, of which fruit is just one small aspect. If you’ve never experienced a “good” Bordeaux, this would be a good bottle to try. It’s normally $50, but right now you can pick it up for $19.99 at The Party Source. The cork is difficult to remove, but the wine is beautifully intact, and worth buying and saving for a special dinner. Again, pair this with roasted beef or lamb with rich gravy and/or buttery mashed potatoes to bring out the more subtle fruit flavors. 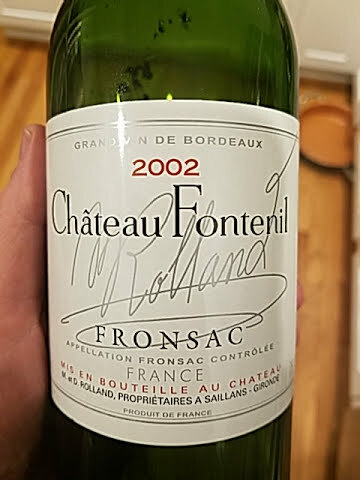 On my five-cork scale based on taste and value, the 2002 Chateau Fontenil Fronsac gets 3.75 corks. It isn’t often you can taste an expensive Bordeaux for less than $20! It’s not for the faint of heart, but recommended for the experience.